Workshop participants make decisions about land use and its impact on water as part of a Project WET activity. Project WET Workshop Facilitators conduct workshops throughout Missouri. Project WET activities teach students how to think, but not what to think. "Water Quality? Ask the Bugs!" simulates a stream environment. Play Invaders! to learn more about invasive species. This summer and fall of 2018, we will be working to correlate all WET activities to the Missouri Learning Standards for Science. We still have the GLE/CLE document available here, if needed, and WET has been correlated to the Next Generation Science Standards. That information can be found at www.projectwet.org/standards. Project WET’s award-winning Curriculum and Activity Guide 2.0 is loaded with interdisciplinary activities about watersheds and water quality along with science concept activities. This guide is recommended by the National Science Teachers Association (NSTA). 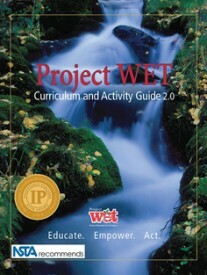 Training at a Project WET workshop includes the Activity Guide and web portal membership.Sign up for a workshop to receive your training and a copy of the Project WET Curriculum Activity Guide!